Introduction: Oral corticosteroids are the first-line treatment for idiopathic childhood nephrotic syndrome. Most children experience several relapses, needing repeated courses of corticosteroid therapy. This exposes them to side effects and long-term complications. For most patients, long-term prognosis is for complete resolution of the disease over time and maintenance of normal kidney function. Therefore, it is vital to focus on minimising adverse events of the disease and its therapy. Unfortunately, no randomised controlled trials are available to determine the optimal corticosteroid treatment of an infrequent relapse of nephrotic syndrome. Recent studies show that treatment schedules for the first episode can safely be shortened to 2 months. The hypothesis of the REducing STEroids in Relapsing Nephrotic syndrome (RESTERN) study is that a 4-week reduction of alternate-day steroids after inducing remission is effective and safe, reduces steroid exposure by 35% on average and is therefore preferable. 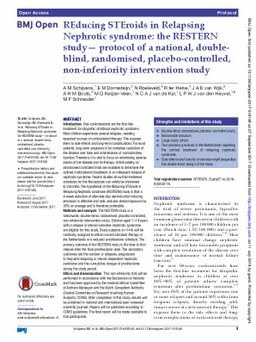 Methods and analysis: The RESTERN study is a nationwide, double-blind, randomised, placebo-controlled, non-inferiority intervention study. Children aged 1-18 years with a relapse of steroid-sensitive nephrotic syndrome are eligible for this study. Study subjects (n=144) will be randomly assigned to either current standard therapy in the Netherlands or a reduced prednisolone schedule. The primary outcome of the RESTERN study is the time to first relapse after the final prednisolone dose. The secondary outcomes are the number or relapses, progression to frequent relapsing or steroid dependent nephrotic syndrome and the cumulative dosage of prednisolone during the study period. Ethics and dissemination: This non-inferiority trial will be performed in accordance with the Declaration of Helsinki and has been approved by the medical ethical committee of Arnhem-Nijmegen and the Dutch Competent Authority (Central Committee on Research Involving Human Subjects, CCMO). After completion of this study, results will be published in national and international peer-reviewed scientific journals. Papers will be published according to CCMO guidelines. The final report will be made available to trial participants. Trial registration number NTR5670, EudraCT no 2016-002430-76.